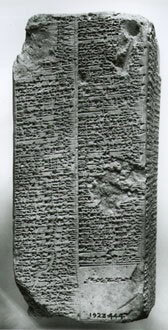 The Sumerian King List is an ancient list of Mesopotamian rulers: their names, their seat of power and the length of their reigns. The list as we have it today is actually a critical reconstruction of nearly 20 ancient fragments published in 1939 by the renowned Danish, Sumerologist Thorkild Jacobson. The list is of special interest to the biblical archaeological community, particularly because of its antediluvian (pre-flood) portion. The list of pre-flood kings is interesting for two reasons. First, because it mentions an antediluvian civilization and a cataclysmic deluge, and second, because the pre-flood kings have really long life-spans (as is evidenced by their really long reigns). After the flood, the life-spans drop dramatically but remain inordinately long for a time. The length of monarchial reigns gradually decreases until they reflect ordinary life-spans. This parallels the biblical account somewhat, except that the life-spans represented in the Sumerian King List are a lot longer than those in the biblical account. The average reign of the antediluvian king in the Sumerian King List was 30,150 years. The average life-span of the biblical antediluvian patriarch recorded in Genesis was 858 years (no where near as long but still inordinately long). Dr. Raul Lopez believes that the information contained in the antediluvian portion of the Sumerian King List may have originated with the Semitic “Noah’s Flood” tradition and thus supports the Genesis account. He believes that the gross discrepancies in the ages can be accounted for quite simply by a major difference between the Semitic numbering system and the Sumerian’s, and the fact that both civilizations used the same symbols to express numbers. The Semitic people used a decimal (base 10) system like the one we use today. The Sumerians used a sexagesimal (base 60) system. Dr. Lopez believes that the two people groups used the same symbols to express numbers (so that the Semitic “10” shared the same symbol as the Sumerian “60,” etc.) and that when a Sumerian scribe came across a Semitic tablet (or perhaps an oral tradition) purporting to document details concerning the antediluvian kings, he misinterpreted the numbers and his error was passed on. Learn More About Biblical Archaeology!